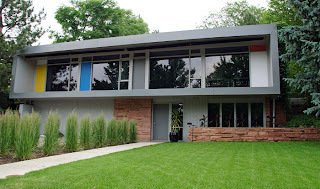 So you're probably wondering, "What the heck does Colorado have to do with Oklahoma Modern?" Well, for one Colorado borders Oklahoma. Barely. 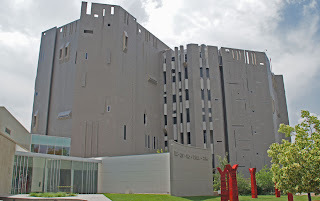 Also the renowned architect Charles Deaton, designer of the "sculpture house" that overlooks I-70 west of Denver and is best known from the movie Sleeper, was raised in Oklahoma. Taking a break at a tea room from Tajikistan. Boulder is an interesting town. Driving takes a little getting used to since bicycles and pedestrians outnumber cars in some areas. 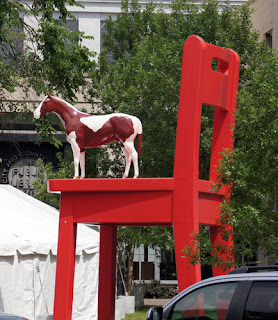 Once we were downtown we parked our hybrid and enjoyed a walk along the central business district. The county courthouse was built in the Thirties after the previous building burned to the ground. Very nice Art Deco detailing in the classic fascisto style. 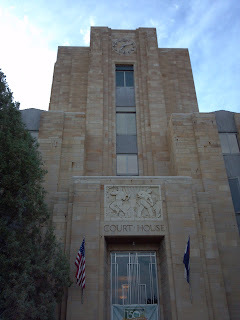 We wondered if people hated this "new fangled" courthouse when it was built. I was happy to see the clock still works. 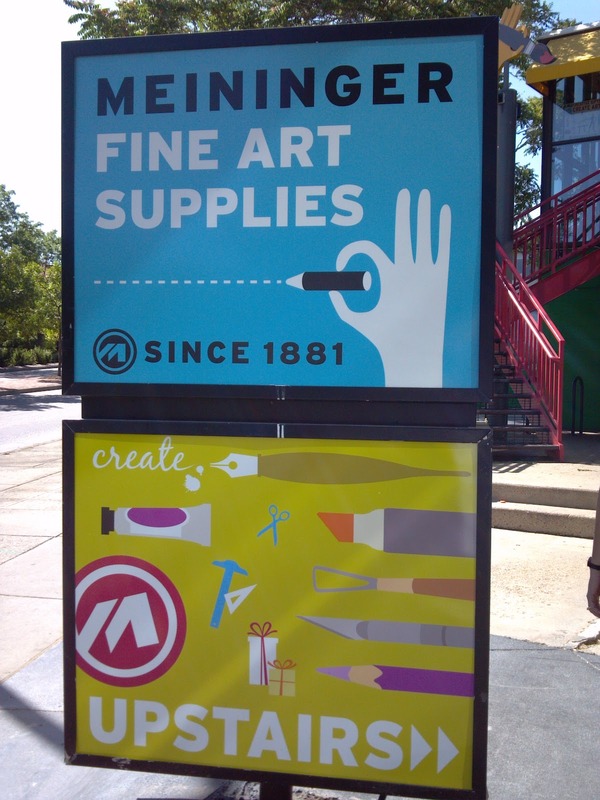 Interesting art store in a split level building with parking underneath. Unfortunately there wasn't really any good angle to take a picture of it. But their sign was pretty cool. 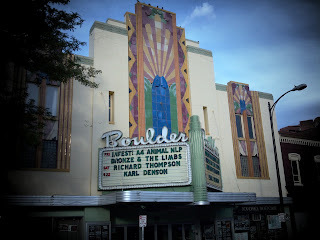 Another lovely Art Deco gem was the Boulder Theater. It's in wonderful condition and fully functional. Our first Rocky Mountain encounter with modernism was a visit to the National Center for Atmospheric Research (NCAR). The Mesa Lab facility overlooks Boulder from Table Mesa and monitors all sorts of atmospheric stuff. 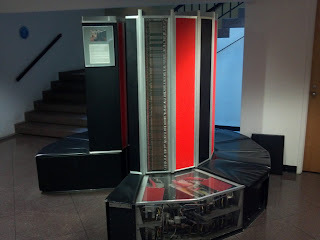 This is a geek's delight- offering a guided tour, hands-on exhibits and a Cray Supercomputer (which most people would mistake for airport seating). But the building itself is a must-see attraction. 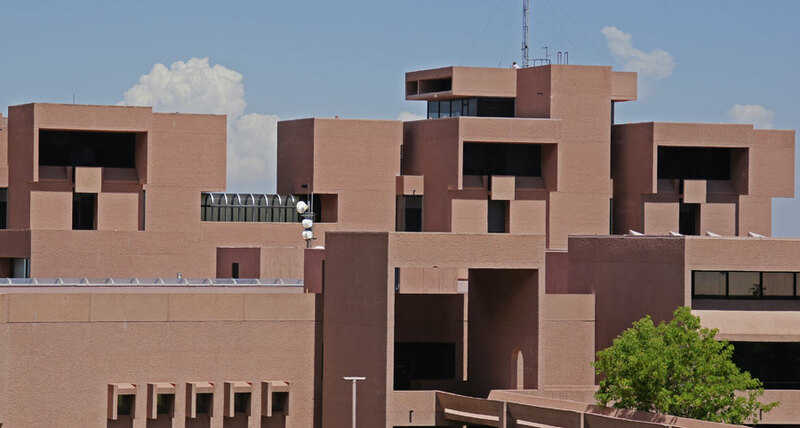 Designed by I. M. Pei in 1962 the design was intended to echo the surrounding red sandstone rocks. Pei took his inspiration from Anasazi cliff dwellings- and it shows. 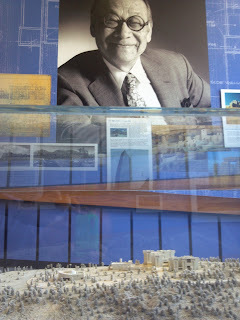 Pei overlooks an architectural model in the NCAR lobby. I've heard the building called Brutalist- but I would disagree. It's certainly a cubist take on the pueblo idea, but the blocky towers have a strangely organic feel. Also the purposeful manipulation of the concrete seems to run counter to most examples of Brutalism. The building may appear to be nothing more than concrete, but Pei instructed that local sand be added to the mixture to match the color of the adjacent mountains. 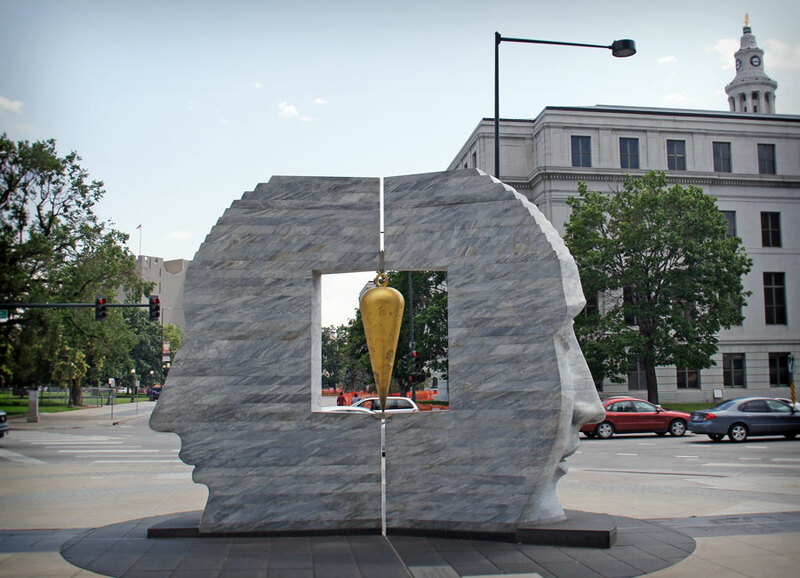 Plus a texture was applied so it isn't merely just "raw concrete." But whatever you call it- it's cool. Fifty years on and it works, and appears to work well. The tour is also a treat. Along with hands-on exhibits there are some interesting tidbits of space-age technology. As a repository for jillions of measurements from all over the globe the NCAR has been on the cutting edge of computer technology since it opened in 1963. Visitors are welcome and guided tours are available three days a week at noon. We highly recommend it! We spent most of one day visiting Denver. I wish we could have spent more time exploring the city. 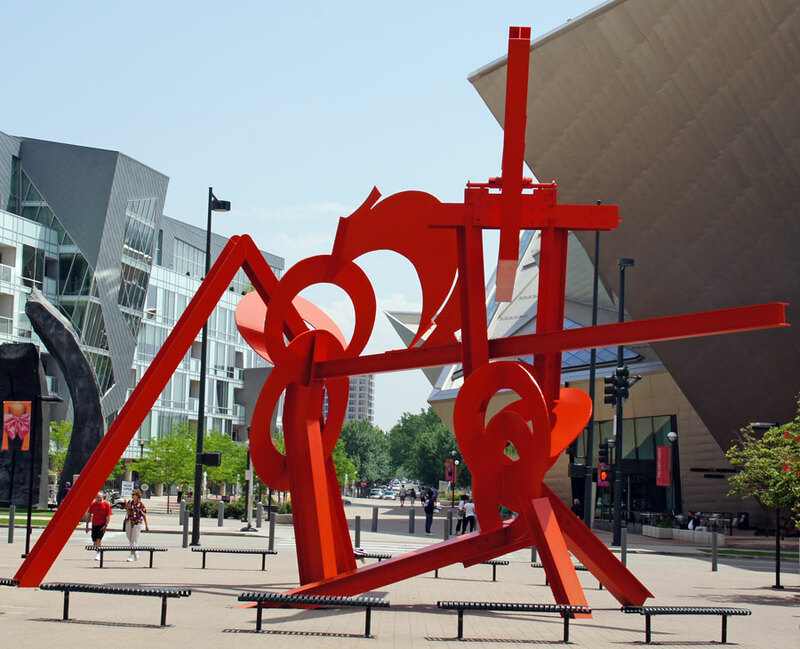 Arapahoe Acres was on the top of our list for sites to visit in Denver. But on the way a rotund blob near the highway caught my eye. Turned out it was a bank designed by Charles Deaton. Originally built as the Key Savings & Loan, this blobolicious bank is on Grand Boulevard in Englewood, Colorado (mere blocks from Arapahoe Acres). Check our Modern Map for specific location! 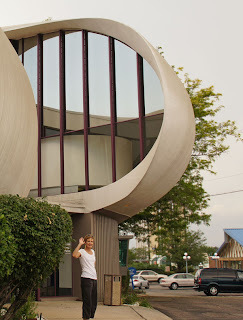 Deaton's "sculpture house" appeared in the 1973 Woody Allen movie, Sleeper. 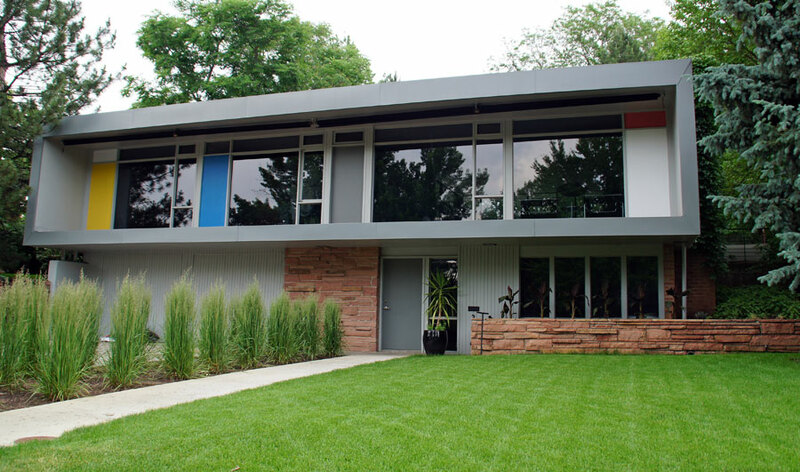 In fact Sleeper is a veritable romp through Colorado modernism, featuring the NCAR Mesa Laboratory along with many other Colorado moderns. There's a wonderful catalog of locations and structures used in the movie on a website called The Denver Eye. 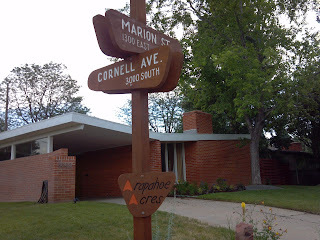 After a quick tour of the bank (where indoor photography is frowned upon) we continued on to the Arapahoe Acres neighborhood. As thunderstorm clouds gathered we toured this historic neighborhood, enjoying all the styles and details. Homes here were built between 1949 and 1957. The styles also span quite a range- from low-slung classic Ranch to boxy Bauhaus. 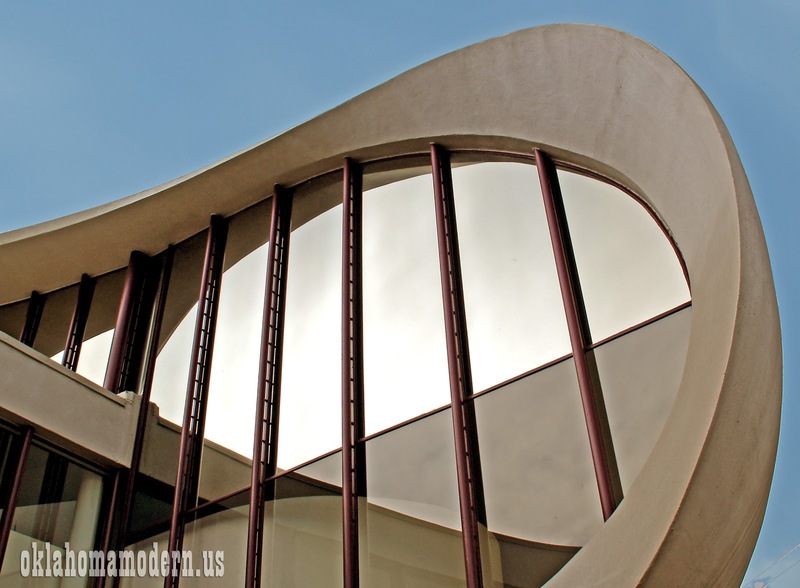 The area is well kept and, for the most part, appreciated for the modernist aesthetic. 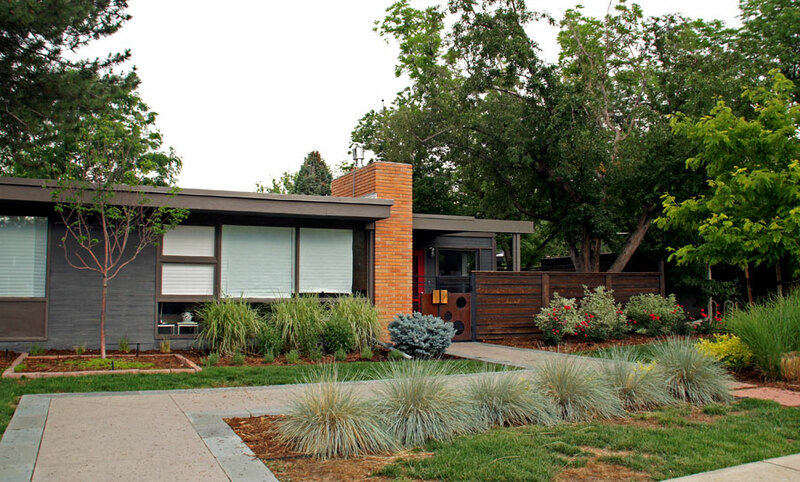 This was the first postwar neighborhood to ever be designated as a National Register Historic District. But there are no covenants or protections in place. We only saw a couple of examples of inappropriate repairs and "remuddling." It appears that no matter where you travel you can find examples of historic neighborhoods attracting buyers, who then proceed to ravage the very elements that attracted them in the first place. Finally, we ended our tour ogling some of Denver's downtown buildings. A walk through the library provided welcome relief from the heat- not to mention some wonderful artwork to look at. An exhibit about local murals was quite fascinating. The Denver Art Museum's North Building was designed in 1971 by Gio Ponti. It's interesting but I can't help but think of Soviet-era tenements. Sculpture in the square between the Denver Public Library and Denver Art Museum's Hamilton Building by Daniel Libeskind. Art abounds- like this giant chair adorning the library lawn.